London hardware independent opens the doors to the first of two new additions to its store portfolio, having completely refurbished the shop on Upper Road, Islington and opened for trading in under six weeks. 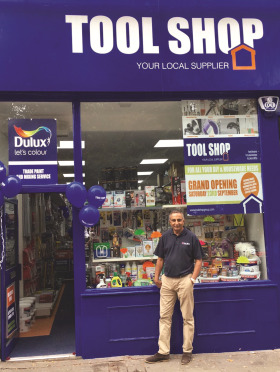 The new outlet is Tool Shop’s second on the busy North London road will act as a bolt-on store to its existing shop, selling more housewares, as well as a Dulux Trade paint offer and full locksmith services. Tool Shop owner, Vin Vara, who is also president of the British Independent Retailers Association (BIRA) told DIY Week that he saw a gap in trade sales and locksmith services in the area, which lead him to look for a new site. The second new store, which is located on Camden High Street is set to open in November. The former bookshop – a 1,000sq ft location that Mr Vara says he has been after for a number of years – will also undergo a full refit to bring it in line with the rest of the Tool Shop chain. When open, it will provide a full hardware offer and locksmith service. Last month Mr Vara revealed plans to have 15 stores trading by Easter. Tool Shop will also launch its new web site coinciding with the opening of the 11th store in Camden mid November. Having turned the project around in such a short space of time, Mr Vara paid tribute to his Tool Shop staff, as well as Salepoint and a number of suppliers, including Stax, AWD, Davenport, Kitchen Craft and various Bira direct suppliers.